Proprietary Name: Matzim La What is the Proprietary Name? Non-Proprietary Name: Diltiazem Hydrochloride What is the Non-Proprietary Name? Matzim La with NDC 70518-1950 is a a human prescription drug product labeled by Remedyrepack Inc.. The generic name of Matzim La is diltiazem hydrochloride. The product's dosage form is tablet, extended release and is administered via oral form. FDA Application Number: ANDA077686 What is the FDA Application Number? Matzim LA (diltiazem hydrochloride) extended-release tablets are indicated for the treatment of hypertension, to lower blood pressure. Lowering blood pressure reduces the risk of fatal and nonfatal cardiovascular events, primarily strokes and myocardial infarctions. These benefits have been seen in controlled trials of antihypertensive drugs from a wide variety of pharmacologic classes including this drug.Control of high blood pressure should be part of comprehensive cardiovascular risk management, including, as appropriate, lipid control, diabetes management, antithrombotic therapy, smoking cessation, exercise, and limited sodium intake. Many patients will require more than one drug to achieve blood pressure goals. For specific advice on goals and management, see published guidelines, such as those of the National High Blood Pressure Education Program’s Joint National Committee on Prevention, Detection, Evaluation, and Treatment of High Blood Pressure (JNC).Numerous antihypertensive drugs, from a variety of pharmacologic classes and with different mechanisms of action, have been shown in randomized controlled trials to reduce cardiovascular morbidity and mortality, and it can be concluded that it is blood pressure reduction, and not some other pharmacologic property of the drugs, that is largely responsible for those benefits. The largest and most consistent cardiovascular outcome benefit has been a reduction in the risk of stroke, but reductions in myocardial infarction and cardiovascular mortality also have been seen regularly.Elevated systolic or diastolic pressure causes increased cardiovascular risk, and the absolute risk increase per mmHg is greater at higher blood pressures, so that even modest reductions of severe hypertension can provide substantial benefit. Relative risk reduction from blood pressure reduction is similar across populations with varying absolute risk, so the absolute benefit is greater in patients who are at higher risk independent of their hypertension (for example, patients with diabetes or hyperlipidemia), and such patients would be expected to benefit from more aggressive treatment to a lower blood pressure goal.Some antihypertensive drugs have smaller blood pressure effects (as monotherapy) in black patients, and many antihypertensive drugs have additional approved indications and effects (e.g., on angina, heart failure, or diabetic kidney disease). These considerations may guide selection of therapy.Matzim LA (diltiazem hydrochloride) extended-release tablets may be used alone or in combination with other antihypertensive medications. Matzim LA (diltiazem hydrochloride) extended-release tablets are indicated to improve exercise tolerance in patients with chronic stable angina. Take Matzim LA (diltiazem hydrochloride) extended-release tablets once a day at approximately the same time. Do not chew or crush the tablet. Initiate dosing at 180 to 240 mg once daily, although some patients may respond to lower doses. Titrate according to blood pressure to a maximum of 540 mg daily. Maximum antihypertensive effect is usually observed by 14 days of chronic therapy. Initiate dosing at 180 mg once daily and increase dose at intervals of 7 to 14 days if adequate response is not obtained, to a maximum of 360 mg. Patients controlled on diltiazem alone or in combination with other medications may be switched to diltiazem hydrochloride extended-release tablets once-a-day at the nearest equivalent total daily dose. Higher doses of Matzim LA (diltiazem hydrochloride) extended-release tablets may be needed in some patients based on clinical response. 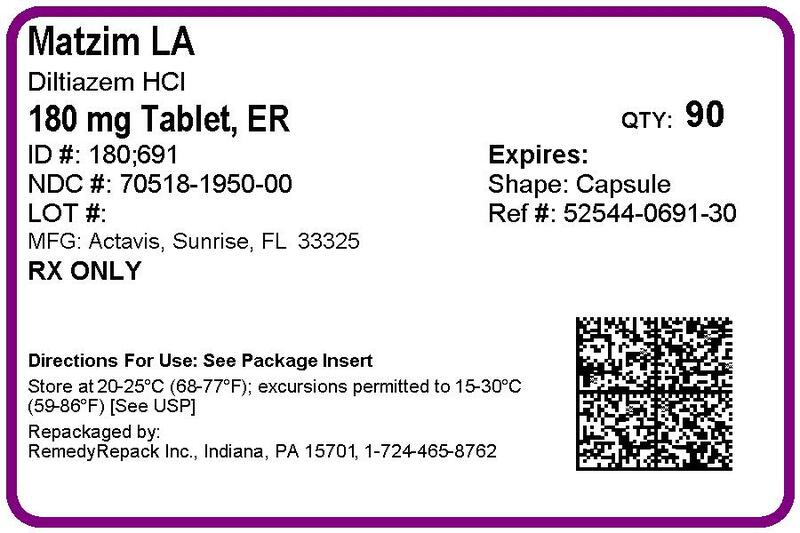 Matzim LA (diltiazem hydrochloride) extended-release tablets are contraindicated in:Patients with sick sinus syndrome except in the presence of a functioning ventricular pacemaker.Patients with second- or third-degree AV block except in the presence of a functioning ventricular pacemakerPatients with hypotension (less than 90 mm Hg systolic).Patients who have demonstrated hypersensitivity to the drug.Patients with acute myocardial infarction and pulmonary. No dose adjustment is likely to be needed for mild-moderate hepatic impairment.
. Monitor for effects on heart rate and cardiac conduction. Worsening of heart failure has been reported in patients with impairment of ventricular function. Experience with the use of diltiazem in combination with beta-blockers in patients with impaired ventricular function is limited. Significant elevations in liver enzymes such as alkaline phosphatase, LDH, AST (SGOT), ALT (SGPT) and signs of acute hepatic injury have been reported with diltiazem therapy. These reactions tended to occur early after therapy initiation (1 to 8 weeks) and have been reversible upon discontinuation of drug therapy. Mild elevations of transaminases with and without concomitant elevation in alkaline phosphatase and bilirubin have also been observed. Such elevations were usually transient and frequently resolved even with continued diltiazem treatment. Stevens-Johnson syndrome, toxic epidermal necrolysis, erythema multiforme and/or exfoliative dermatitis have been reported. Gastrointestinal: Anorexia, constipation, diarrhea, dry mouth, dysgeusia, dyspepsia, thirst, vomiting, weight increase. The following adverse reactions have been identified during post-approval use of diltiazem. Because these reactions are reported voluntarily from a population of uncertain size, it is not always possible to estimate their frequency or establish a causal relationship to drug exposure.The following post-marketing reactions have been reported infrequently in patients receiving diltiazem: acute generalized exanthematous pustulosis, allergic reactions, alopecia, angioedema (including facial or periorbital edema), erythema multiforme, extrapyramidal symptoms, gingival hyperplasia, hemolytic anemia, increased bleeding time, leukopenia, photosensitivity (including lichenoid keratosis and hyperpigmentation at sun-exposed skin areas), purpura, retinopathy, myopathy, and thrombocytopenia.In addition, events such as myocardial infarction have been observed which are not readily distinguishable from the natural history of the disease in these patients.A number of well-documented cases of generalized rash, some characterized as leukocytoclastic vasculitis, have been reported. Ivabradine Concurrent use of diltiazem increases exposure to ivabradine and may exacerbate bradycardia and conduction disturbances. Avoid concomitant use of ivabradine and diltiazem. Pregnancy category C. Reproduction studies have been conducted in mice, rats, and rabbits. Administration of doses ranging from five to ten times (on a mg/kg basis) the daily recommended therapeutic dose has resulted in embryo and fetal lethality. These doses, in some studies, have been reported to cause skeletal abnormalities. In the perinatal/postnatal studies, there was an increased incidence of stillbirths at doses of 20 times the human dose or greater.There are no well-controlled studies in pregnant women; therefore, use diltiazem in pregnant women only if the potential benefit justifies the risk to the fetus. Diltiazem is excreted in human milk. One report suggests that concentrations in breast milk may approximate serum levels. Because of the potential for serious adverse reactions in nursing infants from diltiazem, a decision should be made whether to discontinue nursing or to discontinue the drug, taking into account the importance of the drug to the mother. 50 in dogs is considered to be in excess of 50 mg/kg, while lethality was seen in monkeys at 360 mg/kg. The toxic dose in man is not known. Blood levels after a standard dose of diltiazem can vary over tenfold, limiting the usefulness of blood levels in overdose cases.There have been 29 reports of diltiazem overdose in doses ranging from less than 1 g to 18 g. Sixteen of these reports involved multiple drug ingestions.Twenty-two reports indicated patients had recovered from diltiazem overdose ranging from less than 1 g to 10.8 g. There were seven reports with a fatal outcome; although the amount of diltiazem ingested was unknown, multiple drug ingestions were confirmed in six of the seven reports.Events observed following diltiazem overdose included bradycardia, hypotension, heart block, and cardiac failure. Most reports of overdose described some supportive medical measure and/or drug treatment. Bradycardia frequently responded favorably to atropine as did heart block, although cardiac pacing was also frequently utilized to treat heart block. Fluids and vasopressors were used to maintain blood pressure and in cases of cardiac failure, inotropic agents were administered. In addition, some patients received treatment with ventilatory support, gastric lavage, activated charcoal, and/or intravenous calcium.In the event of overdose or exaggerated response, institute appropriate supportive measures and gastrointestinal decontamination. Diltiazem does not appear to be removed by peritoneal or hemodialysis. Limited data suggest that plasmapheresis or charcoal hemoperfusion may hasten diltiazem elimination following overdose. Based on the known pharmacological effects of diltiazem and/or reported clinical experiences, the following measures may be considered:Bradycardia: Administer atropine (0.60 to 1.0 mg). If there is no response to vagal blockage, administer isoproterenol cautiously. Hypotension: Use vasopressors (e.g., dopamine or norepinephrine). Diltiazem hydrochloride, USP is a white to off-white crystalline powder with a bitter taste. It is soluble in water, methanol and chloroform. It has a molecular weight of 450.99. Matzim LA (Diltiazem Hydrochloride) Extended-Release Tablets, for oral administration, are formulated as a once-a-day extended-release tablet containing 180 mg, 240 mg, 300 mg, 360 mg or 420 mg of diltiazem hydrochloride.Also contains: candelilla wax powder, colloidal silicon dioxide, corn starch, ethylcellulose, hypromellose, lactose monohydrate, magnesium stearate, microcrystalline cellulose, nonoxynol 100, polyacrylate dispersion, polyethylene oxide, polysorbate 80, povidone, sucrose, talc, titanium dioxide and triacetin. The therapeutic effects of diltiazem are believed to be related to its ability to inhibit the cellular influx of calcium ions during membrane depolarization of cardiac and vascular smooth muscle.Hypertension: Diltiazem produces its antihypertensive effect primarily by relaxation of vascular smooth muscle and the resultant decrease in peripheral vascular resistance. The magnitude of blood pressure reduction is related to the degree of hypertension; thus hypertensive individuals experience an antihypertensive effect, whereas there is only a modest fall in blood pressure in normotensives. Angina: Diltiazem has been shown to produce increases in exercise tolerance, probably due to its ability to reduce myocardial oxygen demand. This is accomplished via reductions in heart rate and systemic blood pressure at submaximal and maximal workloads. Diltiazem has been shown to be a potent dilator of coronary arteries, both epicardial and subendocardial. Spontaneous and ergonovine-induced coronary artery spasms are inhibited by diltiazem. In animal models, diltiazem interferes with the slow inward (depolarizing) current in excitable tissue. Diltiazem causes excitation-contraction uncoupling in various myocardial. Diltiazem produces relaxation of coronary vascular smooth muscle and dilation of both large and small coronary arteries at drug levels which cause little or no negative inotropic effect. The resultant increases in coronary blood flow (epicardial and subendocardial) occur in ischemic and nonischemic models and are accompanied by dose-dependent decreases in systemic blood pressure and decreases in peripheral resistance. in vitro ligand binding studies have also shown diltiazem hydrochloride binding is not altered by therapeutic concentrations of digoxin, hydrochlorothiazide, phenylbutazone, propranolol, salicylic acid, or warfarin. The plasma elimination half-life following single or multiple drug administration is approximately 3.0 to 4.5 hours. Desacetyl diltiazem is also present in the plasma at levels of 10% to 20% of the parent drug and is 25% to 50% as potent as a coronary vasodilator as diltiazem. Minimum therapeutic plasma diltiazem concentrations appear to be in the range of 50 to 200 ng/mL. There is a departure from linearity when dose strengths are increased; the half-life is slightly increased with dose. A study that compared patients with normal hepatic function to patients with cirrhosis found an increase in half-life and a 69% increase in bioavailability in the hepatically impaired patients. A single study in nine patients with severely impaired renal function showed no difference in the pharmacokinetic profile of diltiazem compared to patients with normal renal function. Matzim LA (Diltiazem Hydrochloride) Extended-Release Tablets: A single 360 mg dose of Matzim LA (diltiazem hydrochloride) extended-release tablets results in detectable plasma levels within 3 to 4 hours and peak plasma levels between 11 and 18 hours; absorption occurs throughout the dosing interval. The apparent elimination half-life for Matzim LA (diltiazem hydrochloride) extended-release tablets after single or multiple dosing is 6 to 9 hours. When Matzim LA (diltiazem hydrochloride) extended-release tablets were coadministered with a high fat content breakfast, diltiazem peak and systemic exposures were not affected indicating that the tablet can be administered without regard to food. As the dose of Matzim LA (diltiazem hydrochloride) extended-release tablets is increased from 120 to 240 mg, area-under-the-curve increases 2.5-fold. Drug InteractionsImpact of diltiazem on other coadministered drugsAnesthetics: The depression of cardiac contractility, conductivity, and automaticity as well as the vascular dilation associated with anesthetics may be potentiated by calcium channel blockers. When used concomitantly, anesthetics and calcium blockers should be titrated carefully. max by 2-fold, compared to placebo. The elimination half-life of midazolam and triazolam also increased (1.5- to 2.5­ fold) during coadministration with diltiazem. These pharmacokinetic effects seen during diltiazem coadministration can result in increased clinical effects (e.g., prolonged sedation) of both midazolam and triazolam. Beta-blockers: Controlled and uncontrolled domestic studies suggest that concomitant use of diltiazem and beta-blockers is usually well tolerated, but available data are not sufficient to predict the effects of concomitant treatment in patients with left ventricular dysfunction or cardiac conduction abnormalities. Administration of diltiazem concomitantly with propranolol in five normal volunteers resulted in increased propranolol levels in all subjects and bioavailability of propranolol was increased approximately 50%. max of buspirone were not significantly affected by diltiazem. Enhanced effects and increased toxicity of buspirone may be possible during concomitant administration with diltiazem. Subsequent dose adjustments may be necessary during coadministration, and should be based on clinical assessment. Carbamazepine: Concomitant administration of diltiazem with carbamazepine has been reported to result in elevated serum levels of carbamazepine (40% to 72% increase), resulting in toxicity in some cases. Cyclosporine: A pharmacokinetic interaction between diltiazem and cyclosporine has been observed during studies involving renal and cardiac transplant patients. In renal and cardiac transplant recipients, a reduction of cyclosporine dose ranging from 15% to 48% was necessary to maintain cyclosporine trough concentrations similar to those seen prior to the addition of diltiazem. If these agents are to be administered concurrently, cyclosporine concentrations should be monitored, especially when diltiazem therapy is initiated, adjusted, or discontinued. The effect of cyclosporine on diltiazem plasma concentrations has not been evaluated. (0→∞) of quinidine by 51%, elimination half-life by 36%, and decreases its oral clearance by 33%. Monitor for quinidine adverse effects and adjust the dose adjusted. Statins: Diltiazem has been shown to increase significantly the AUC of some statins. The risk of myopathy and rhabdomyolysis with statins metabolized by CYP3A4 may be increased with concomitant use of diltiazem. When possible, use a non-CYP3A4-metabolized statin together with diltiazem; otherwise, dose adjustments for both diltiazem and the statin should be considered along with close monitoring for signs and symptoms of any statin related adverse events. max during diltiazem coadministration. Diltiazem plasma levels were not significantly affected by lovastatin or pravastatin. Impact of other coadministered drugs on diltiazem include, but not limited to:RifampinCoadministration of rifampin with diltiazem lowered the diltiazem plasma concentrations to undetectable levels. Coadministration of diltiazem with rifampin or any known CYP3A4 inducer should be avoided when possible, and alternative therapy considered.Cimetidine and RanitidineA study in six healthy volunteers has shown a significant increase in peak diltiazem plasma levels (58%) and AUC (53%) after a 1-week course of cimetidine at 1200 mg per day and a single dose of diltiazem 60 mg. Ranitidine produced smaller, non-significant increases. The effect may be mediated by cimetidine’s known inhibition of hepatic cytochrome P-­450, the enzyme system responsible for the first-pass metabolism of diltiazem. Patients currently receiving diltiazem therapy should be carefully monitored for a change in pharmacological effect when initiating and discontinuing therapy with cimetidine. An adjustment in the diltiazem dose may be warranted. in vitro in bacteria. No evidence of impaired fertility was observed in a study performed in male and female rats at oral dosages of up to 100 mg/kg/day. 120 mg240 mg360 mg540 mg360 mg-2.0-4.4-4.4-8.1-6.4A second randomized, double-blind, parallel-group, dose-response study (N=258) evaluated Matzim LA (diltiazem hydrochloride) extended-release tablets following morning doses of placebo or 120, 180, 300, or 540 mg. Diastolic blood pressure measured by supine office cuff sphygmomanometer at trough (7 AM to 9 AM) decreased in an apparently linear manner over the dosage range studied. Group mean changes for placebo, 120 mg, 180 mg, 300 mg and 540 mg were -2.6, -1.9, -5.4, -6.1, and -8.6 mm Hg, respectively.Whether the time of administration impacts the clinical benefits of antihypertensive treatment is not known. Postural hypotension is infrequently noted upon suddenly assuming an upright position. No reflex tachycardia is associated with the chronic antihypertensive effects. The effects of Matzim LA (diltiazem hydrochloride) extended-release tablets on angina were evaluated in a randomized, double-blind, parallel-group, dose-response trial of 311 patients with chronic stable angina. Evening doses of 180, 360, and 420 mg were compared to placebo and to 360 mg administered in the morning. All doses of Matzim LA (diltiazem hydrochloride) extended-release tablets administered at night increased exercise tolerance when compared with placebo after 21 hours. The mean effect, placebo-subtracted, was 20 to 28 seconds for all three doses, and no dose-response was demonstrated. Matzim LA (diltiazem hydrochloride) extended-release tablets, 360 mg, given in the morning, also improved exercise tolerance when measured 25 hours later. As expected, the effect was smaller than the effects measured only 21 hours following nighttime administration. Matzim LA (diltiazem hydrochloride) extended-release tablets had a larger effect to increase exercise tolerance at peak serum concentrations than at trough. Bottles of 30 NDC 52544-0695-30 Bottles of 90 NDC 52544-0695-19 Store at 20° to 25°C (68° to 77°F) [See USP Controlled Room Temperature].Avoid excessive humidity and temperatures above 30°C (86°F).Dispense in tight, light resistant container as defined in USP.